How do I view and print submission document files? By default, when you click on a submission's name in the Submissions tab and are taken to the Submission Details page, you'll see the Summary view containing details about the submission, such as its title, cover letter, and any files that the submitter uploaded with the submission. 2. You'll be taken to the File view, where you can preview the entire uploaded file. 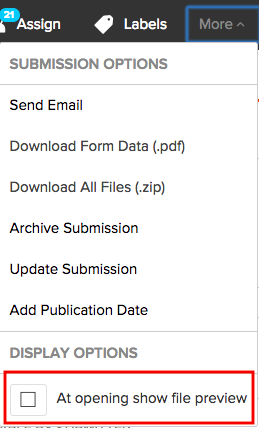 If there are multiple files in the submission, you can navigate to them by clicking on the < > arrow buttons or choosing a specific file from the dropdown menu at the bottom of the screen. 3. To switch back to the Summary view, click the X button in the upper right-hand corner of the screen. 4. To set whether your default view is the File view or the Summary view, click the More menu at the top right side of the Submission Details page and check or uncheck the "At opening show file preview" check box. The next time you visit the Submission Details page, your preferred default view will appear.